Once you try Vegetarian Skillet Enchiladas that are made on your stovetop, you may never go back to the oven-baked version. They're made with an easy to make red enchilada sauce and stuffed full of summer veggies and crispy, pan-fried tortillas. 4 words: summer. veggie. skillet. enchiladas. That is all you need to carry you through the rest of this summer. Heck, it just might be all you need for the rest of your life. We all know how delish enchiladas are. Are you with me? But let's be honest, who wants to turn on their oven when it's already a bazillion degrees inside? Not this gal, thank you very much! 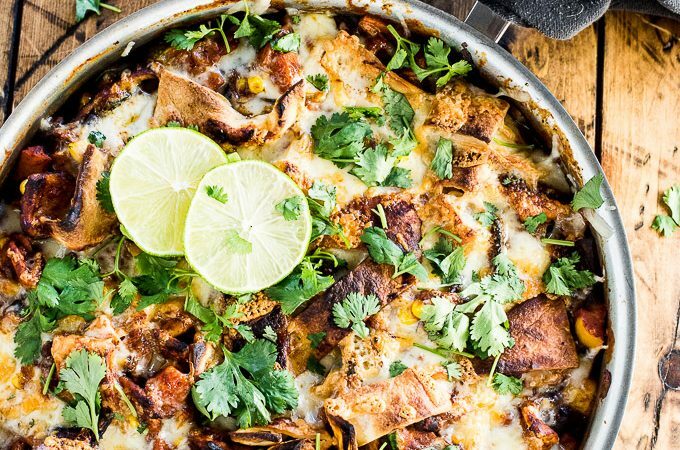 Skillet enchiladas are the ticket to keeping your enchilada game going all summer long. Doing the happy dance. ♡ A skillet full of summer veggies, caramelized to perfection. Think zucchini, carrots, bell peppers, and sweet summertime corn. ♡ The tastiest red enchilada sauce you will ever meet. Sweet tomatoes, smoky chipotle, and spicy chili. ♡ Cheese. Melty, gooey, delicious cheese. Top with a squeeze of lime and a dollop of sour cream and you have dreamy skillet enchiladas made for delicious summertime dinners. Do you see that cheese? Omgee it's doing my head in right now. I don't normally share recipes that are smothered in cheese and there's no part of my brain that can remember why I don't. I mean, just look at that. Cheese makes everything better. You won't be upset if I share more cheese-laden recipes coming up in the very near future, will you? There are two teams when it comes to the sauce: Team Tomato and Team No Tomato. I'm firmly planted in Team Tomato. IMO enchilada sauce made without tomatoes always tastes a little dull. It's like there's something missing. You know, like tomatoes. By adding tomatoes to the sauce you add a sweetness and depth that you don't get by using only chili powder and stock. Tomatoes make the sauce. If you've never made your own enchilada sauce, now is the time to start. It's super easy and once you've made one batch, you'll never understand why you bought it before. If you make these Summer Veggie Skillet Enchiladas make sure you snap a pic and tag @theendlessmeal on Instagram so I can like and comment on your photos. I love seeing TEM recipes you create! Once you try Vegetarian Skillet Enchiladas that are made on your stovetop, you may never go back to the oven-baked version. They're made with an easy to make red enchilada sauce and stuffed full of summer veggies and crispy, pan-fried tortillas. If you're looking for a delicious, one pot, crowd-pleaser dinner recipe, this is it! Whisk the grapeseed oil and flour together in a small pot over medium heat. Bring it to a boil and let it bubble for 1 minute to get rid of the fresh flour taste. Add the rest of the enchilada sauce ingredients to the pot and bring the pot to a boil. Reduce the heat to low, cover to prevent splatters, and simmer the sauce for 10 minutes, stirring a couple of times. While the sauce is cooking, prepare the rest of the skillet enchiladas. Add enough oil to thinly cover the bottom of a large skillet over medium-high heat. Add the tortilla strips to the skillet all at once and cook, tossing occasionally, until most of the tortilla strips are crispy and brown. Remove them from the skillet. Add another small splash of oil to the skillet. Add the mushrooms and cook, stirring occasionally, until they are brown, about 8 minutes. Add the onion and cook for 5 minutes. Add the garlic, carrots, zucchini, and bell pepper to the skillet and cook them, stirring occasionally, until they begin to soften. Add the corn and let it heat through. Place half the fried tortilla strips into the skillet and mix them around with the veggies. Pour in the enchilada sauce and mix everything together. Top the skillet enchiladas with the remaining tortilla strips, pressing them into the sauce. Generously sprinkle the top with cheese. Let the skillet enchiladas simmer for or until the cheese is melted and be skillet is hot and bubbly, about 10 minutes. Optional step: broiled the skillet enchiladas for a few minutes to brown the cheese. This recipe TASTES great, but chefs beware: this meal takes twice as long to make as the recipe suggests and it is NOT a one-pot meal. You WILL need to make the sauce separately from the rest of the recipe. Additionally, my mouth was watering at the photo but sadly, I realized after finishing the recipe that the ingredient list (which I used while doing my shopping) does not include avocados, cilantro, limes, or sour cream, so I didn’t purchase these items and was quite disappointed when I plated this 75-minute meal and realized they were missing (but which are clearly present in the photo). Definitely a yummy dinner but it was much more time than I hoped to spend on a weeknight dinner and lacked the accompaniments that drew me to the recipe in the first place. This recipe was so good. I have never had homemade enchilada sauce before and now I can never go back. We also used corn tortillas strips and those with the homemade sauce made the whole recipe. Even my food critic husband loved it and helped me cook it! This is bookmarked!